This is what legal betting looks like in the US. Are a third of Venmo transactions right now illegal gambling payments? The NCAA championship basketball tournaments are now underway and Americans—as they do every year—have undertaken a massive distributed illegal gambling conspiracy to wager on the outcomes of the games. 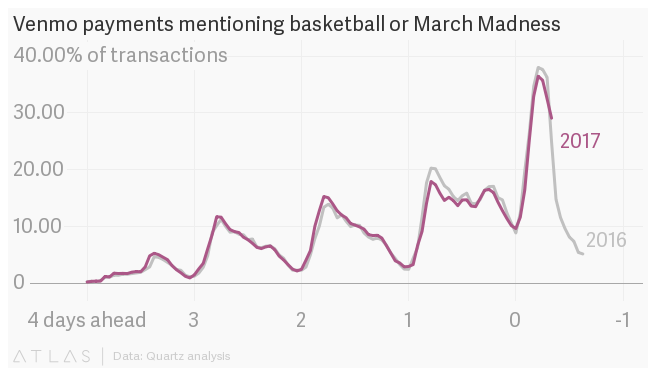 Since the tournament draw was announced, about 10% of public transactions on money-transfer app Venmo have been at least superficially basketball related, according to a Quartz analysis of such transactions. 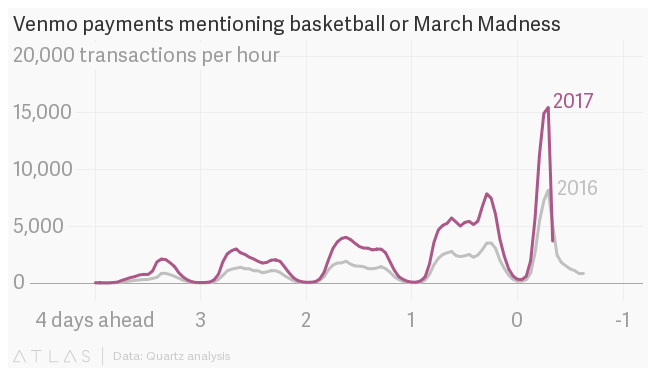 This morning (March 16), minutes ahead of the first game, was apparently the peak time to buy in. 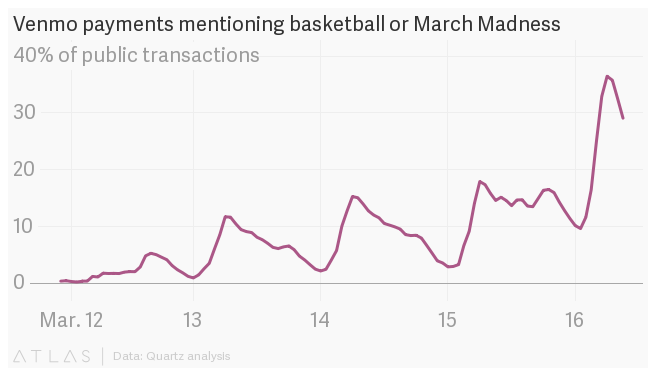 NCAA betting pools, known as March Madness pools, could have accounted for more than a third of total transaction volume on Venmo at that time. PayPal-owned Venmo is only available for use in the US and there is little disagreement that these pools are illegal there, running afoul of a litany of laws. Authorities have not made small-scale gambling pools an enforcement priority. “PayPal and Venmo take compliance with all applicable laws, rules and regulations seriously,” a spokesman for Venmo told Quartz in an email. “If there is ever a situation where evidence of gambling activity is brought to our attention, Venmo works quickly to take appropriate action.” Using Venmo for gambling is prohibited by its terms of service. Digital payment platforms like Venmo have made collecting these wagers significantly easier across larger geographic areas, let alone a corporate campus. But Venmo isn’t only processing transactions; it’s a social network where people can make their payments viewable to their friends or the public. The number of transactions matching these criteria during the period between the announcement of the draw and the first game has drastically increased from last year. However the proportion of those transactions related to the betting pools is similar. These figures only account for Venmo posts that are made public on the platform. PayPal CFO John Rainey told CNBC today that 90% of Venmo transactions are viewable at least to a payer’s friends. The company would not provide Quartz a similar figure for posts that are entirely public. It is possible transactions about these betting pools are more likely to be made private, and thus these figures would understate the amount of gambling activity on the platform. In the case that the transactions are more likely to be made public than other payments, these figures would overstate the popularity of using Venmo for betting. The public transaction data also does not include information on the size of a payment, but if assuming an average $10 buy-in, Venmo has possibly facilitated over $2.5 million in betting this year. That’s a negligible contribution to total betting on the tournament: The American Gaming Association estimates that $10.4 billion will be wagered (legally and illegally) on March Madness games and in pools this year.